To understand the cause of the pain one must understand the anatomy of the foot and some basic mechanics in the function of the foot. A thick ligament, called the plantar fascia, is attached into the bottom of the heel and fans out into the ball of the foot, attaching into the base of the toes. The plantar fascia is made of dense, fibrous connective tissue that will stretch very little. It acts something like a shock absorber. As the foot impacts the ground with each step, it flattens out lengthening the foot. This action pulls on the plantar fascia, which stretches slightly. When the heel comes off the ground the tension on the ligament is released. Anything that causes the foot to flatten excessively will cause the plantar fascia to stretch greater that it is accustom to doing. One consequence of this is the development of small tears where the ligament attaches into the heel bone. When these small tears occur, a very small amount of bleeding occurs and the tension of the plantar fascia on the heel bone produces a spur on the bottom of the heel to form. 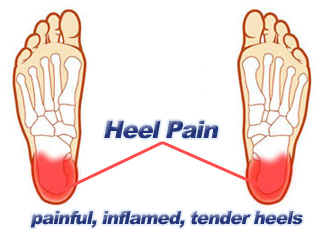 Pain experienced in the bottom of the heel is not produced by the presence of the spur. The pain is due to excessive tension of the plantar fascia as it tears from its attachment into the heel bone. Heel spur formation is secondary to the excessive pull of the plantar fascia where it attaches to the heel bone. Many people have heel spurs at the attachment of the plantar fascia with out having any symptoms or pain. There are some less common causes of heel pain but they are relatively uncommon. There are several factors that cause the foot to flatten and excessively stretching the plantar fascia. The primary factor is the structure of a joint complex below the ankle joint, called the subtalar joint. The movement of this joint complex causes the arch of the foot to flatten and to heighten. Flattening of the arch of the foot is termed pronation and heightening of the arch is called supination. If there is excessive pronation of the foot during walking and standing, the plantar fascia is strained. Over time, this will cause a weakening of the ligament where it attaches into the heel bone, causing pain. When a person is at rest and off of their feet, the plantar fascia attempts to mend itself. Then, with the first few steps the fascia re-tears causing pain. Generally, after the first few steps the pain diminishes. This is why the heel pain tends to be worse the first few steps in the morning or after rest. Another factor that contributes to the flattening of the arch of the foot is tightness of the calf muscles. The calf muscle attaches into the foot by the achilles tendon into the back of the heel. When the calf muscle is tight it limits the movement of the ankle joint. When ankle joint motion is limited by the tightness of the calf muscle it forces the subtalar joint to pronate excessively. Excessive subtalar joint pronation can cause several different problems to occur in the foot. In this instance, it results in excessive tension of the plantar fascia. Tightness of the calf muscles can be a result of several different factors. Exercise, such as walking or jogging will cause the calf muscle to tighten. Inactivity or prolonged rest will also cause the calf muscle to tighten. Women who wear high heels and men who wear western style cowboy boots will, over time, develop tightness in the calf muscles. Essentially rest from aggravating activity, physiotherapy treatment to alleviate the inflammatory component, stretching the tight calf, strengthening up of the intrinsic muscles of the foot e.g. tissue scrunch, picking up pens etc. and correction of biomechanical problems in the foot e.g. orthotics. Sometimes, a heel cup or pad to relieve pressure – a donut type pad may be helpful. Strapping has been shown to be helpful, especially in circumstances where the patient can?t wear orthotics – the foot is strapped to help support the arch. There has been limited success with cortisone injections or surgery and the latter is very rarely required. ← Just What Can Result In Tendon Pain Of The Achilles ? What Is Bursitis Of Your Feet?